Description of your business: Yoga classes are taught 7 days a week in a warm and welcoming environment. Various styles of yoga include flowing yoga, Iyengar-based, core power, therapeutic yoga, YogaBarre, Aerial, and prenatal yoga. 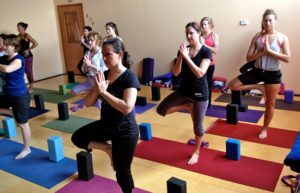 In-depth yoga workshops are offered on a regular basis. Also, we are a Yoga Alliance Certified Yoga Teacher Training School offering a 200 Hour program and a 500 Hour Certification!